Diane and Martin Leat offer you a warm welcome at Bramley Knowle Farm which offers Farmhouse Bed & Breakfast and luxury self-catering accommodation. Bramley Knowle Farm offers many attractions for every visitor. You can relax and enjoy the beautiful Kent countryside, visit the picturesque villages and pubs,walk on some of the many footpaths and visit castles, beaches, ports and country gardens. If you are a business traveller we can offer you early breakfasts, free wifi, good accessibility& excellent parking in comfortable & quiet surroundings. Please note that both the self catering and bed and breakfast are no smoking and we cannot accommodate pets. 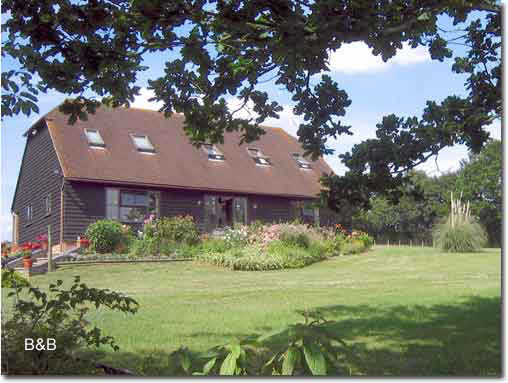 A beautiful and comfortable place to stay in Kent, the Garden of England. Bed & Breakfast and self catering accommodation.